The New South Wales Blues have claimed a historic State of Origin series win, claiming victory in an incredible Game 2, what was one of the best Origin contests in recent memory, holding onto a tense 18-14 lead over the Queensland Maroons. With controversies, tries, sin bins, returning veterans and the next generation of players making their mark on the game, here are nine talking points from State of Origin Game 2. Where to now for the Maroons? For the first time in a very, very… very long time, Queensland find themselves in an interesting position. Losing and on the back foot. Even when the original streak ended in 2014, the Maroons still had all the big name players and momentum behind them, it was more of a speed bump than the end of an era. But this year, now down two games to zip and without the Cameron Smiths, the Johnathan Thurstons or Cooper Cronks to lean on, they find themselves in trouble and trying to find and create a new direction for a new era of players. 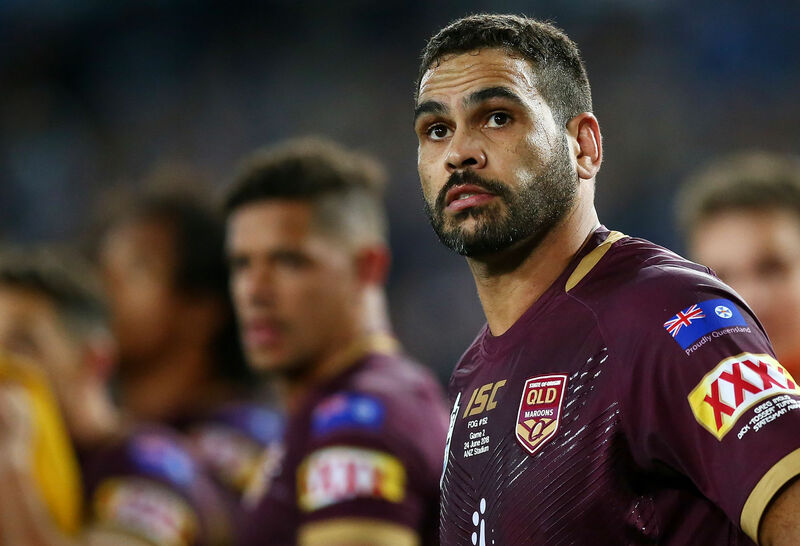 Slater will get a fairytale departure at Suncorp in Game 3 and Greg Inglis may play again next year but his time is running down as well, leaving Queensland in no-mans land with a host of inexperience and youth coming in to make the most of the Origin arena. Don’t get me wrong, these young guns can play, but they’re now losing and without some literal all-time legends in their side and that’s just something Queenslanders of the past 15 years simply aren’t used to and don’t understand. Do they blood new talent? Do they stick to the same game plan and hope execution improves? Does Walters throw caution to the wind and try a whole new strategy for the final contest? What can they do to turn things around? It will be a huge statement on the next generation and coach Kevin Walters how they can bounce back from this in Game 3 and into next year. Dare I say clean sweep? It’s a tantalising phrase to throw out there and one that Blues fans have heard a lot of over the last decade and a half, unfortunately for them in the wrong context, but now they can hold their heads high and throw around all the hypotheticals they want. Hell, they’ve waited long enough. However, and it’s a big one, they have to play at Suncorp Stadium, a venue that is near-impossible to win at if you’re not Queensland. Game 2 saw huge improvements from the series opener for the Maroons and there’s no reason they can’t improve on that and close the series with a respectable win and 2-1 result. 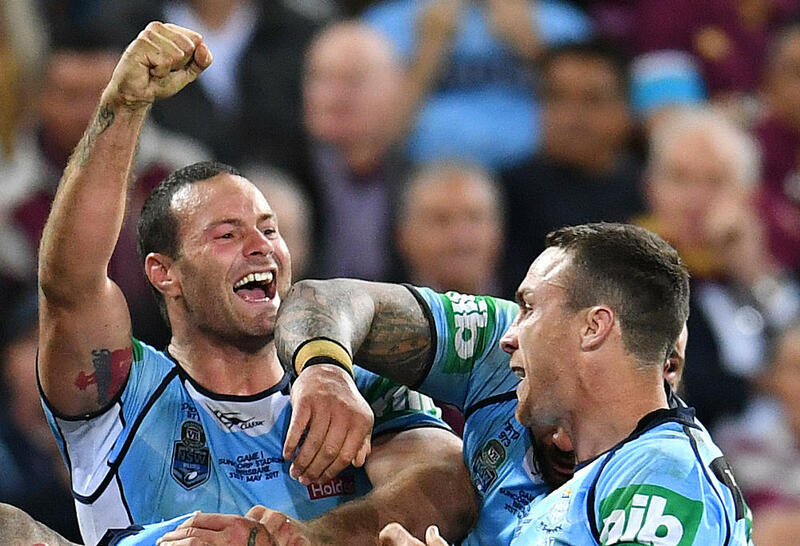 But the Blues can dream, Freddy Fitler can dream and you better believe the long-suffering New South Wales fans will be dreaming of their first series clean sweep since 2000. Oh, New South Wales how you never fail to give your fans a heart attack. About 60 minutes into Game 2, the Blues found themselves in a near-identical position as the previous year where they looked to have the 2017 series wrapped up and broken the streak. We all know they capitulated spectacularly, tripping over themselves at the finish line and ending up giving away the series in a third-game blowout. History so, so nearly repeated itself once again. New South Wales were up 18-10, on top of the contest with 20 minutes to go. Then it happened. Will Chambers crossed the line with 17 minutes to go, bridging the gap to just four points and turning the momentum of the game and likely the series and Earth itself if you had of asked a Blues fan at the time. As Inglis began to run rampant and Slater and Ponga started lurking dangerously out wide there’s no doubt New South Welshmen were copping some severe PTSD in the dying minutes. The Roberts sin bin only added to the anticipation and theatrics of the contest. All the way up to the final Maroons knock and nervy three or four tackles in the dying seconds the game was genuinely up in the air and the chances of a stolen win were on the cards for Queensland. Not to be in the end but man, what a game. How much difference did Slater make? The veteran may be the last of the famed ‘Big Four’ still standing, but one of the greatest fullbacks the game has ever seen certainly still has the legs to keep going at this level. Instantly inside the opening 10 minutes, Slater was making his mark and the Maroons backline had noticeably lifted in tempo, movement and aggressive play from their lacklustre Game 1 effort that saw them go down. The first half, in particular, caused all sorts of issues for the Blues fringe defence as the visitors jumped out to an early lead, and one could argue that it was down to Slater who was creating headaches left, right and centre. His wrap around behind the centres opened up the overlap on the outside multiple times, and while a wraparound is a pretty basic move in rugby league, Slater has the perfected timing and pace to make it work so efficiently and effectively time and time again. His presence at the back under the high ball and on the kick return was something Queensland were missing in the opener in Melbourne as well. There have been greater performances in Origin history and the result may not scream positivity for the Maroons, but those north of the Tweed can rest easy knowing this legend hasn’t run his course and has all the legs left to make his final appearance a memorable one. One of the most polarising calls in rugby league. The penalty try. You either agree with it wholeheartedly or you think it’s the worst decision in the history of mankind. For mine, this was the right call, but that won’t stop fans from throwing arguments around all over the shop. The thing that makes this one so impactful was the timing of it and the way it not only changed Game 2 but the entire series. And dare I say an era? Queensland was up 10-nill with all the momentum on their side. They had the potential to run away with the game and take the decider to the fortress that is Suncorp Stadium for Game 3. As soon as Boyd Cordner was taken out off the ball by Ben Hunt, the writing was on the wall… or on the big screen at least. The Blues put on 18 unanswered points before Queensland were able to stem the flow in the second half but the damage had been done. Despite an incredibly tight finish, it was that penalty try decision that changed the tide of the game, the series and the Maroons dynasty. Sunday Origin… Yay or nay? More specifically, representative weekend… yay or nay? It’s hard to gauge whether or not having Origin on a Sunday or a Wednesday really made a difference, only time and most likely TV and online figures will tell, but the representative weekend as a whole was a resounding success and one that should be repeated. Having attended the Pacific Tests double-header at Campbelltown on Saturday, I can attest first hand that the experiment for the entire weekend, including the women’s Origin, was on fire and an incredible mid-season spectacle to witness. In terms of the players themselves, Origin on a Sunday makes more sense and there are those wearing the jerseys that are strongly in favour. A Sunday game gives more time for rest and a more comfortable turnaround. It avoids players having to make a decision on playing two games in a matter of days or just not returning to club footy at all and missing fixtures. This allows players that full week either side to play for their club and prepare properly for the rep side of things. The man just can’t be stopped! 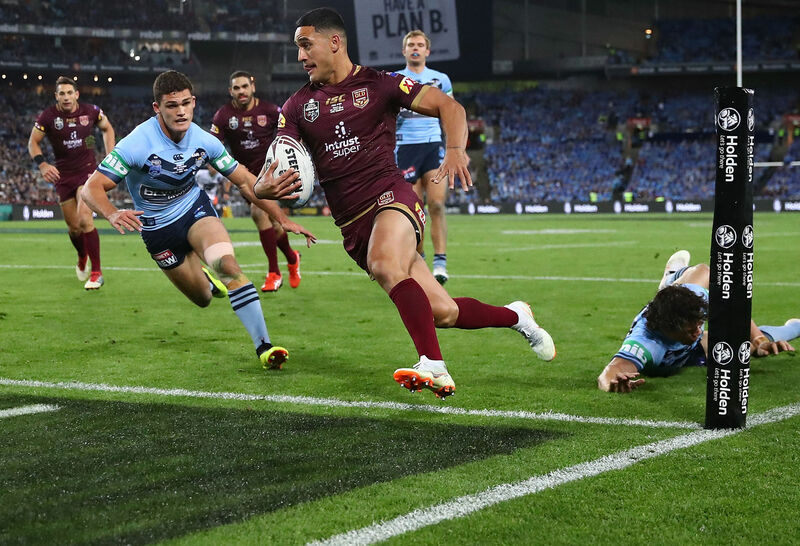 At the end of his career, Valentine Holmes will be one of, if not the, most prolific try-scorers the game has ever seen not only at Origin level but NRL and international. If it’s a game of rugby league, he’ll probably bag a meat pie. For the Sharks, he already has 56 tries from just 92 games. For Australia, he has a slightly ridiculous 14 tries from just 11 games. Finally, in the Origin arena, he now has six from just four games. He’s going at well over a try a game at representative level and shows absolutely zero signs of slowing down. In victory or defeat, the man just knows how to find the line and if his body holds up, there’s no reason why he won’t surpass Greg Inglis as the all-time leading Origin try-scorer and beyond. Does Ponga live up to the hype? Kalyn Ponga has the potential to be a once-in-a-generation player and the hype he brings to any game is routinely backed up on the park. 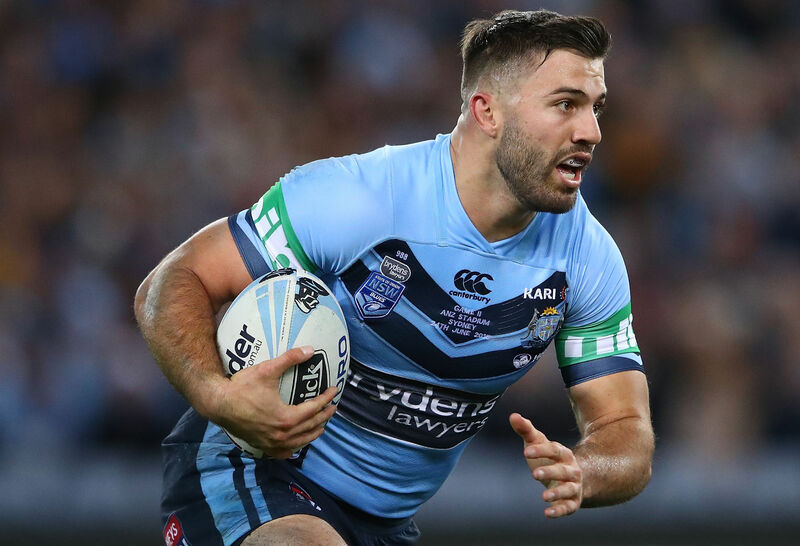 There was confusion and a touch of outrage from some departments when he was snubbed from Game 1 despite the absence of fullback Billy Slater. So when he was finally called up for Game 2 people were understandably excited to see how the young prodigy would fare at a whole new level. Would he take to Origin like the man he will likely replace in the years to come in Billy Slater? Or would he fizzle under the bright lights like Daly Cherry-Evans? Coming on early in the game with his signature headgear on the melon, Ponga was slow to get into the game and make an impact but he had flashes of brilliance in a surprisingly long stint on the park, spending about an hour off the bench on debut. Far from a stunning opening to his Origin career, right on cue the No. 14 launched into action with the game in the balance. With just 12 minutes on the clock and trailing by four, the Knights flier danced his way through the line with ease, showing a blip of what he can do at any level and leading Queensland to the line in the lead up to the huge James Roberts sin bin call. There’s enough there to see his potential and keep him in line to become Slater 2.0 but there’s still plenty of improvement on the table for Kalyn Ponga. Officials will eternally be a talking point in rugby league and Game 2 is no different. There was a controversial no try to Queensland just eight minutes in with Dane Gagai denied in the right corner. Of course, the penalty try was a whole thing. Throw the refs in there with the James Roberts sin bin, a few tight calls and suspect forward passes as well caps off a hectic and full on evening for the match officials who have certainly been under the microscope leading into and during the series.